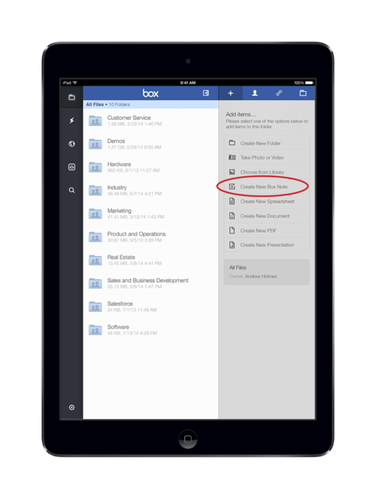 Box has added Notes, its lightweight note-taking tool, to the iPad and iPhone versions of its cloud storage application. Box Notes, announced in September, was rolled out to the Box Web-based version in May, and is the company's first content creation and office productivity software. Box Notes is intended as a complement for the company's flagship enterprise cloud storage and file sharing service, and as such is built into it, rather than offered as a stand-alone tool. The idea is to give Box users a native tool for capturing and sharing information with each other on the fly without having to switch to an external note-taking or word processing app. Box also highlights that as a component of its cloud storage service, Notes benefits from its enterprise security and management features. As such, Box Notes is up against stiff competition from rivals like Microsoft's Word and OneNote, and Google's Docs and Keep, as well as from niche tools from specialists like Evernote and Quip. Notes has a word-processor-like interface where the document creator and colleagues can add content and co-edit in real time. Users can also add hyperlinks in documents. Box has said Notes can be used also for lightweight project planning, group task management and individual to-do lists. Back in September, Box also promised that Notes would let users embed rich media content in documents and do offline editing, and that the tool would retain a history of document versions so it could revert to earlier drafts. These features aren't yet live. On Monday, Box said it plans to incorporate Notes into its Android app later this summer.